Above: all the 3D printed parts for five Saturn V Rigs. The next version of the SkyShield autoKAP controller is ready for you to test. 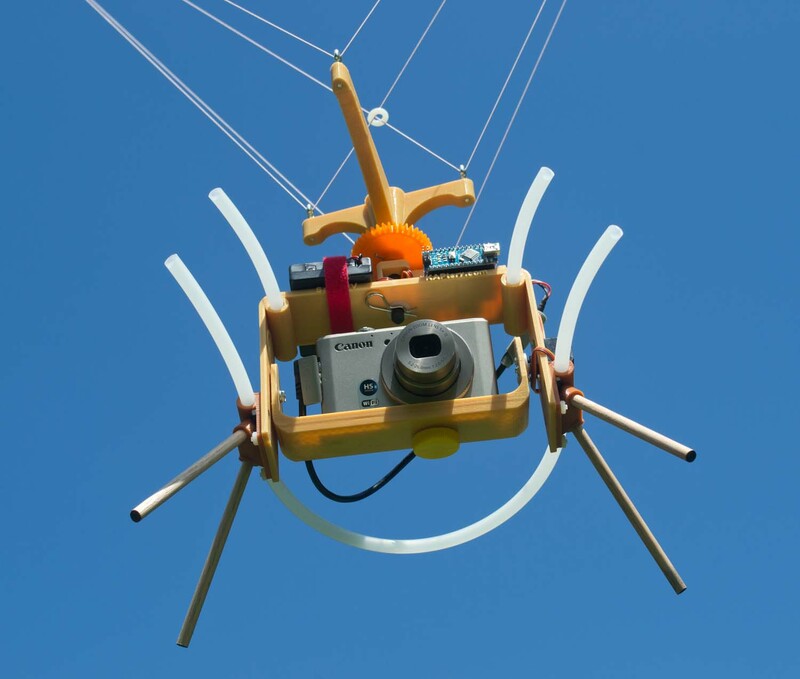 There are a few kits available for sale to anyone interested in trying a microcontroller on a kite aerial photography rig and posting a couple of research notes about your experiences. The KAPtery is offering a package with a ready-to-fly SkyShield and a kit to build a Saturn V Rig and Picavet suspension all for $115. The new version of SkyShield has a DIP switch to select the pan/tilt/shoot regime in the field. 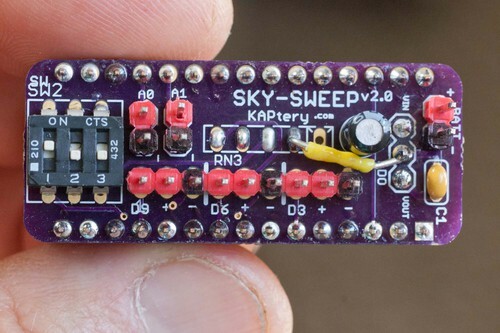 The package includes a completely assembled and tested SkyShield and Arduino Nano, and should be the last version to say "SKY-SWEEP" on it (#CollectorsItem). The package includes everything (except the camera) you need to build a working motorized pan/tilt KAP rig for systematically taking photos to be stitched into panoramas (see some here). The package requires several hours of assembly, including a tiny bit of soldering, and I am eager to hear about how to modify things to improve the kit building process. All the hardware designs and software are open source, and it would be great to hear if you have been able to incorporate some of this work into your own projects. . The package includes everything here except the camera. Some assembly required. I will be doing field work in early July and will not be able to ship any orders from the KAPtery then. So this week is the last chance in a while to place a KAPtery order for this package or a Redstone Rig Kit or other kits. I really like the form factor, the mode switch (should be standard on all arduino boards IMO), and that you're doing a cooperative Arduino auto-KAP project. Many people have gone down the road without documenting very well what they have done. For the most part it's been a lot of people starting from scratch and working fairly hard to get to the similar points. I think you have a good start on something people can add on to and modify in useful ways. Leaving some input and output pins available leaves quite a few options for sensors and cameras. I agree that we are probably reinventing the wheel. There seems to be a huge range of comfort with this type of simple electronics, So people who have figured out how to use a Nano on a KAP rig have a hard time explaining what they did except to the people who know more than they do about electronics. It would be great to make our progress accessible to a lot more people. This is related to the conundrum of whether to offer a very inexpensive kit that requires soldering and will be shunned by most people, or whether to offer a ready-to-fly device that will be as expensive as products already available. Probably the best outcome will be if people modify our design and make it a better device. There still seem to be a lot of different ways to improve it, as evidenced by the GitHub discussion about the power circuit. I'm still not sure whether an LDO, big capacitor, or boost converter offers the best cost/size/performance benefits. I have soldered together all the SkyShields I have now and they are all committed to packages with Saturn V Rigs. If there is one left this weekend I can sell you just the ready-to-go SkyShield controller (and Nano?) if you would like to try it out. It's possible that there will be new SkyShield version manufactured by mid July that will be offered as a kit. But I haven't heard from @DonBlair in a few days and he is the one driving Eagle Cad. The deadline for a mid July iteration is looming. I think the fact that you're working through GitHub and publishing your scripts and discussions is a big positive step. I'm also glad that David Wheeler is doing a detailed write-up on his latest arduino RC-KAP set-up. Although it's fairly complex and specific. And I think a plug and play system is great for helping get a large number of people up and running (and probably not having the resources to provide direct support on making modifications for different cameras, rigs, servos, etc). The framework is there, so people can see what might be the base of more particular systems if they put in the effort on their own. I'll be flying my prototypish arduino rig today. The servos work on an external power controller, my mode switch is a Cherry thumbweel switch, and I'm triggering the magic-lantern modified EOS-M with an infrared LED and the NEX-3 through a hacked shutter button and a two-part optocoupler (focus and shutter). But it's much much much more cumbersome than your set-up. I have ideas about setting up set pan positions with magnets and a reed-switch, and going back to one of my old rigs and using an accelerometer trigger. I still have some CHDK cameras but I haven't been using them much (mostly for infrared). Maybe I'll post a research note here later in the summer if I think I have anything useful to add. Mostly I'm a tinkerer and get things to working, but a not so pretty state.